In this article, I will cover a free online device video mockup maker website. The name of that website is Live Mockups. 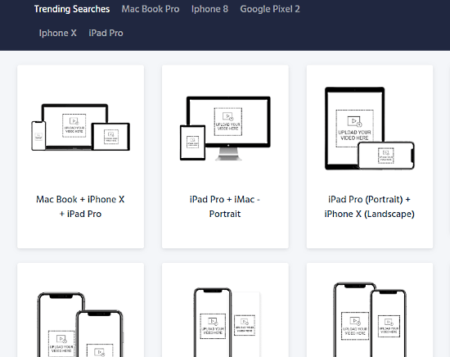 It offers dozens of devices mockups for several popular devices including three formats, Phone, PC, and tablet. You can find mockups of each device in both orientations and use that to quickly make video mockups. 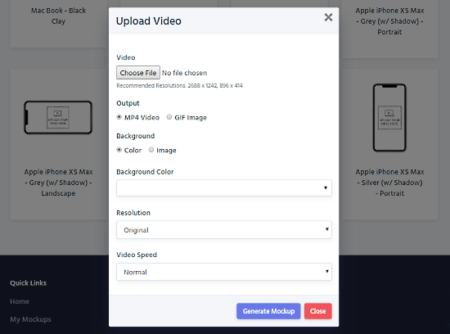 In the mockups, you can add either a video or GIF file along with an optional background image. You can also use a solid color for the background instead of an image. In the end, you can download the mockup as an MP4 or GIF file. You can use this service for free for personal use by adding a link back. Otherwise, you can go with the paid tier that doesn’t require any mention and other expands other limitations as well. Live Mockups service has one free plan and one monthly subscription plan. Both plans let you create unlimited mockup videos for any supported device. The free plan limits the input video size to 100 MB with 7-day storage whereas the paid plan supports video input up to 1 GB with 60-day storage. This service offers dozens of device mockups covering all types of device formats and orientations. Here, you can find various models of iMac, MacBook, iPad, iPhone, Google Pixel, and the Samsung Galaxy lineup. You can choose the desired device to make a mockup for that. When you choose a device, a window pops up on the screen that asks you to upload the video for the mockup. It shows the two resolution options for the respective device; a full resolution and a low resolution with the same aspect ratio. Make sure your video has that same resolution (or aspect ratio), otherwise, it going to float out of the device mockup. After adding the video, you can choose either MP4 or GIF for the output and set video speed. Apart from that, you can also add a photo as mockup background in several resolution options, or go with a solid color. Once all things are set, click the “Generate Mockup” button to start the rendering. Once the render completes, the final mockup appears in your My Mockups section. You can preview it from there and download it to the same format as you choose while creating the mockup. 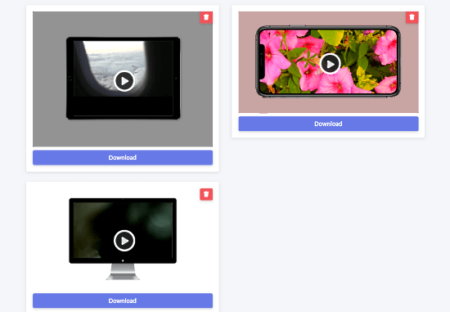 Make video mockup with this free tool here. Live Mockups is a nice online service to quickly make video mockups. It is simple to use and makes professional-grade mockup videos which are ideal for ad-campaigns, marketing, etc.